Please refer to our stock # 7414 when inquiring. 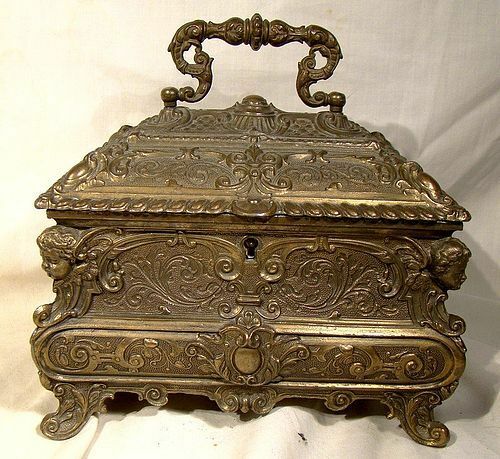 A Renaissance style cast brass jewel chest box casket from the 1960s. This ornate 6-7/8" across casket stands 5-5/8" tall (without the fancy handle) and it is lined with velvet paper and gold edging. It has a working lock (but no key) and it is unsigned. It's very heavy (over 5 lb.) and it is in excellent condition with no dents, bends, corrosion, losses, damage or repairs. All items are thoroughly and conservatively graded and all condition issues are noted; all items are vintage or antique and may have slight signs of gentle use. Expedited tracked and insured parcel shipping to the U.S. starts at $26 (other spots may vary, air is higher). Items paid with a credit card will be shipped to confirmed addresses only. We do ship internationally. All of our prices are in $US. PLEASE NOTE: We DO NOT accept PayPal.